We’ve been taught to believe that bigger is better. When presented with a draping mold, I always made full use of it. 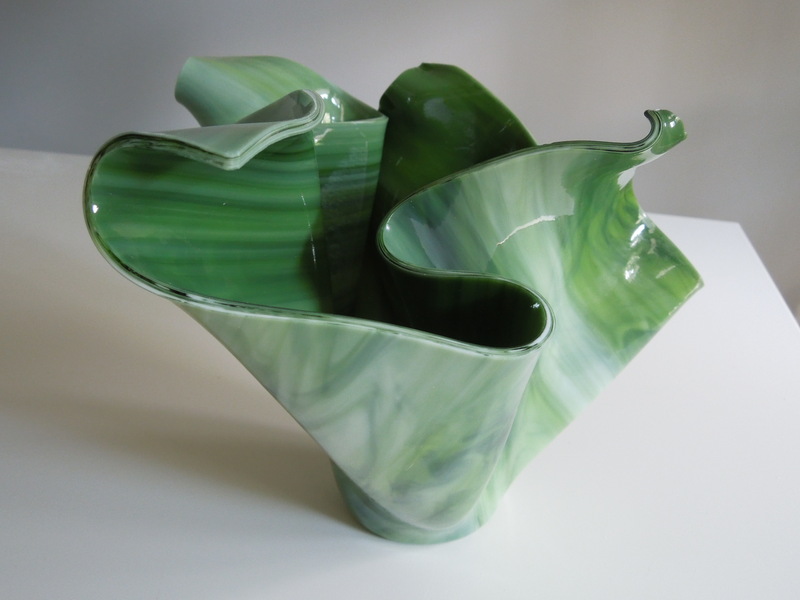 A mold that stands 7″ high should produce a vase that also stands 7″ high. But of course! In fact, I’ve been apologetic that I couldn’t produce larger, more glorious vases due to the size of my kiln. Imagine my surprise when I got an inquiry about miniature bud vases. What exactly did they want? A tall but narrow vase? A short vase? And more importantly, what could I actually make? I had never considered my options. Let’s start with the draping molds or so-called floral drapers I had access to. 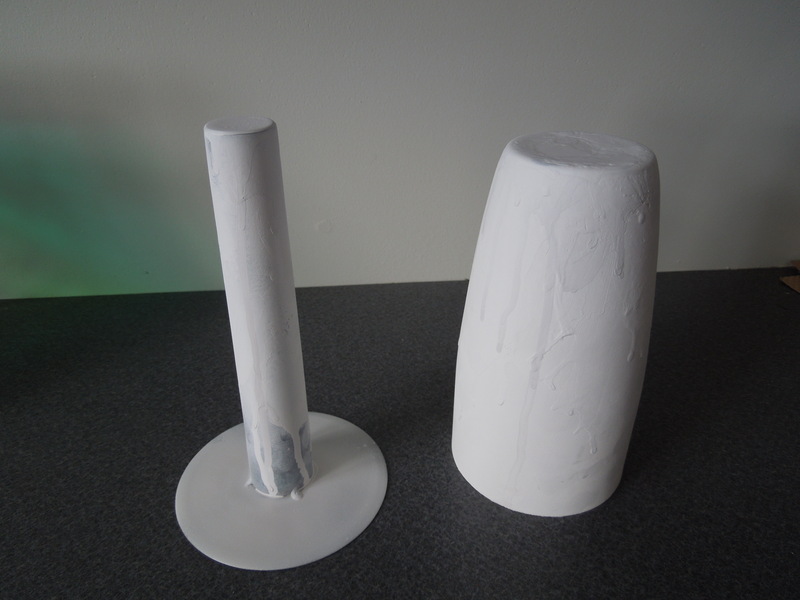 On the right is a mold which stands 7″ tall with a top (the final vase base) that is 2.5″ in diameter. On the left, is a stainless steel pillar also 7″ tall but with a narrower 1″ diameter. Both have been coated with boron nitride (MR-97) which is a glass mold release and makes the shiny stainless look white. 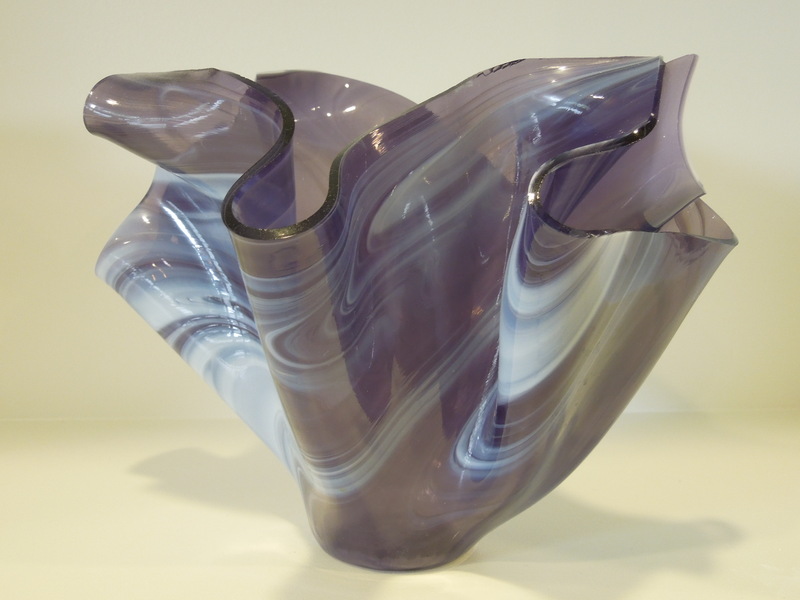 All my previous vases started with a 12″ sheet of glass that would drape around the mold at elevated temperatures and produce a 7″ tall vase. 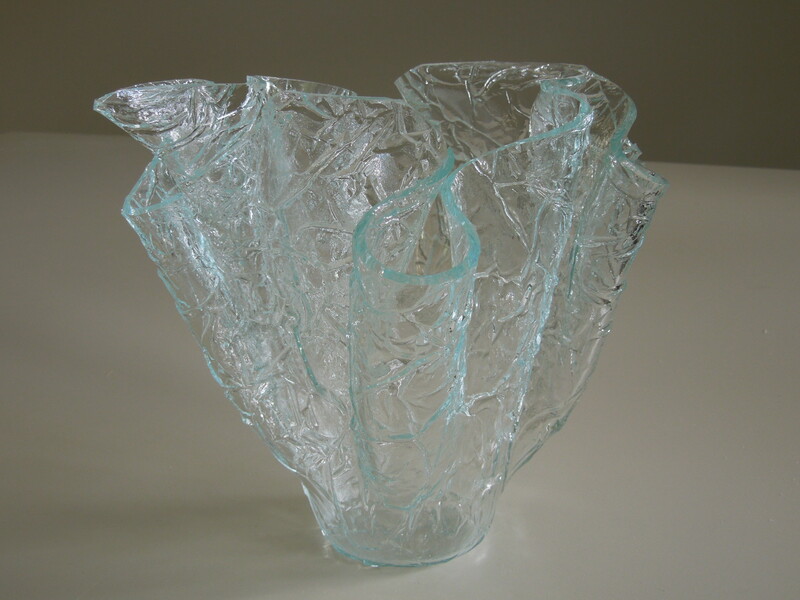 (See my previous post https://geekgirlglass.com/2013/10/19/feeling-the-heat-temperature-dependence-of-draping-vases/) . My obvious first attempt to shrink a vase was to repeat the process but starting with a 8.75″ sheet of glass with rounded edges. 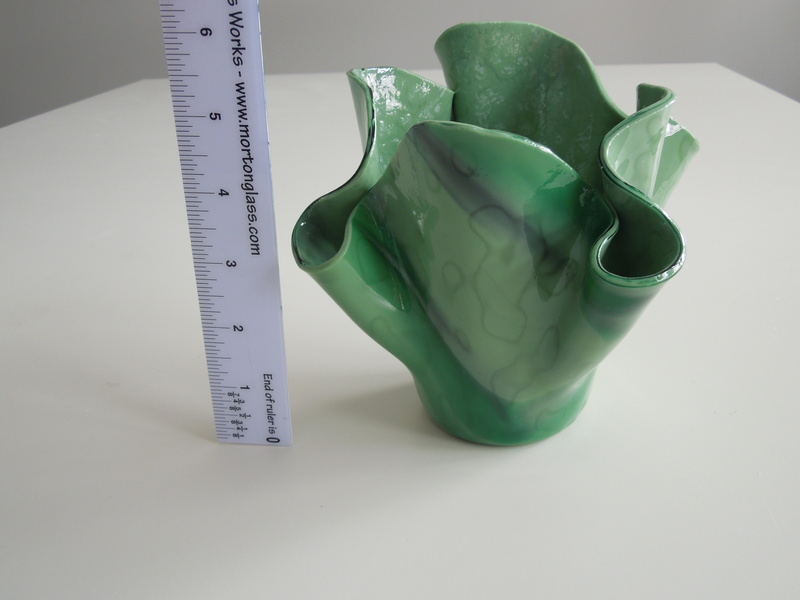 The result was a funky, short fat vase that stood 5″ tall. How about using the 1″ diameter floral draper? I went with a 6″ square of rose colored transparent glass. (Yes, I kept decreasing my starting glass size). 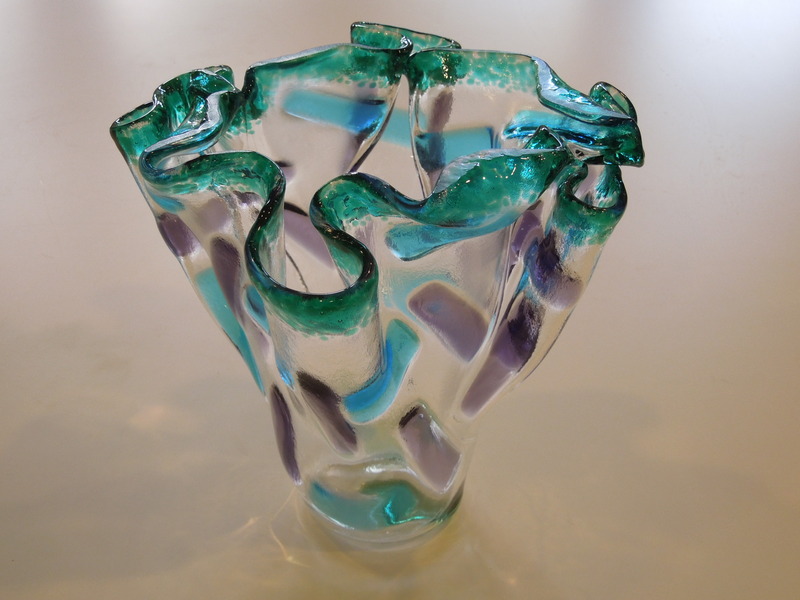 That ended up with a 4″ vase with a small 1″ base and rosy’ flames’ creating the sides. Next attempt used a 7″ circle draped over the 2.5″ form. 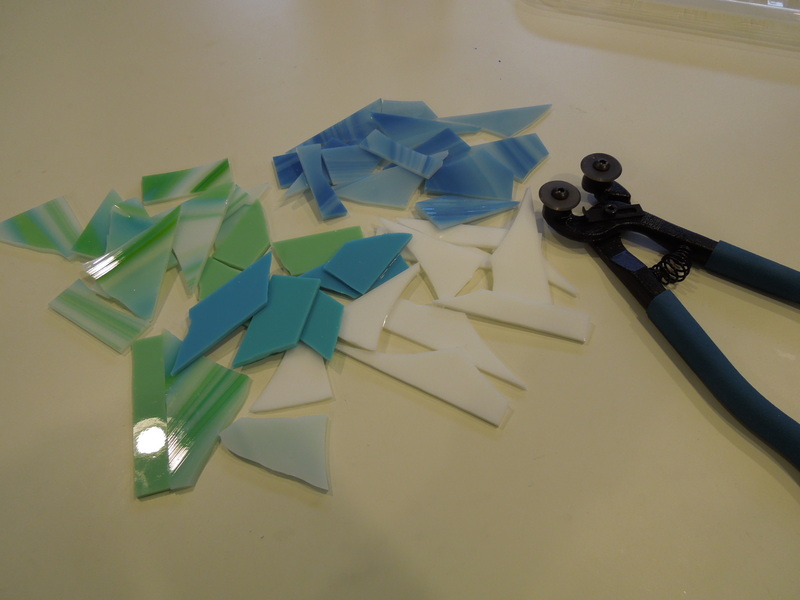 I played with blue frit on the border and confetti glass pieces to create a tribute to Mondrian. This ended up more like a bowl than a vase. Total height = 2″. Fourth variation really pushed the limits. Only a 4.5″ circle of glass was draped over the 1″ form. This resulted in a truly petite 2″ tall vase. Perhaps this is only good for holding a few Jelly-Bellies? 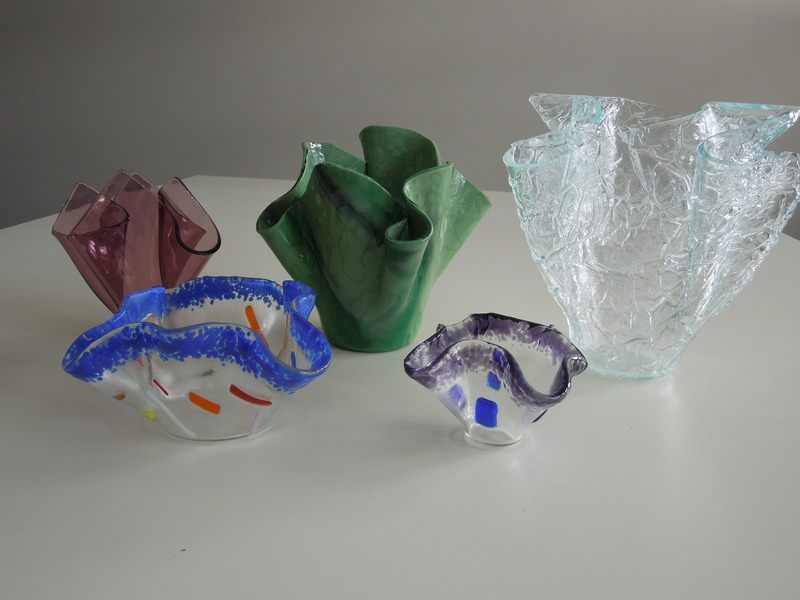 Here is the final line-up of vase variations. one would not know the journey I took to get to this point. Multiple learning ‘opportunities’ went into the creation of this. 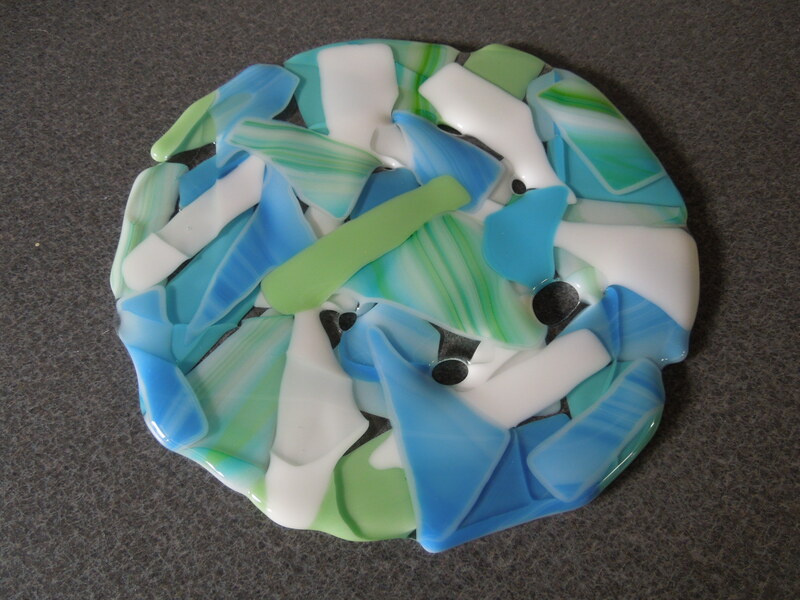 Immediate observations – I went to too high a temperature and everything fused into a solid flat piece – no tack fusing. (Ok, I was learning my kiln’s temperature profile). Also – you’ll note the edges seem very rough. This is because I had to basically break the glass off the kiln shelf. 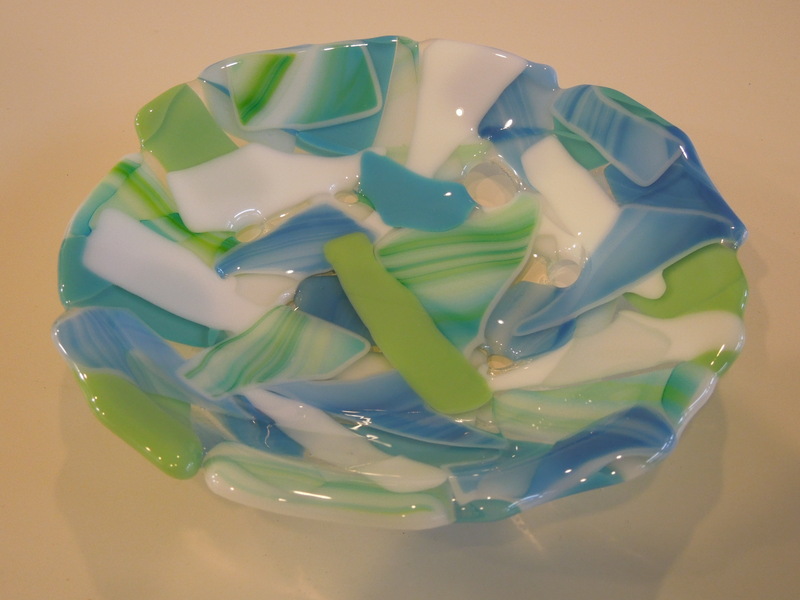 I believed the beginner instruction book that said kiln washing the shelf would be sufficient to prevent glass from sticking. Ha! I’ve used shelf paper between my glass and the kiln shelves ever since. 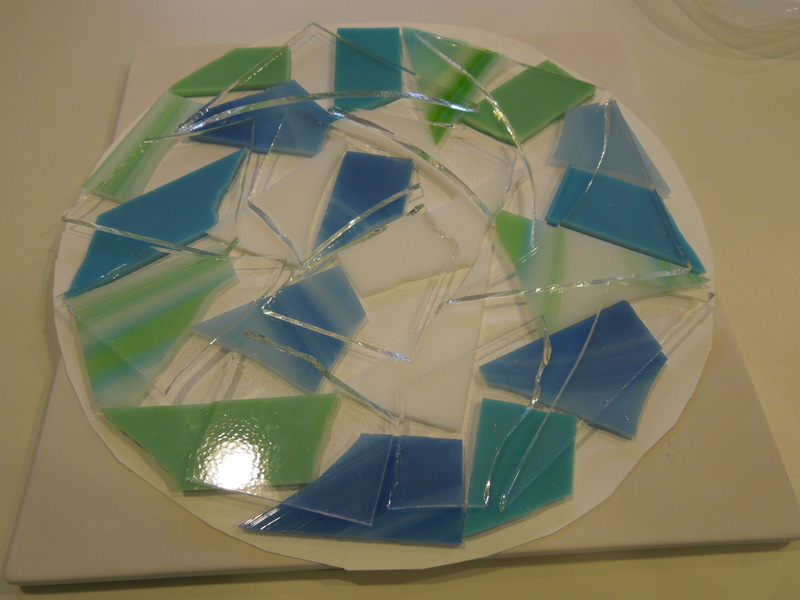 A third observation – the finished glass is very thin. I should have used 2 layers of 3 mm glass and then added my smaller rectangles. Glass naturally wants to re-solidify at a certain thickness (~4 mm) and I didn’t provide enough to make the laws of physics happy. After many months, I decided to revisit my sins and try to make something out of my first fuse attempt. 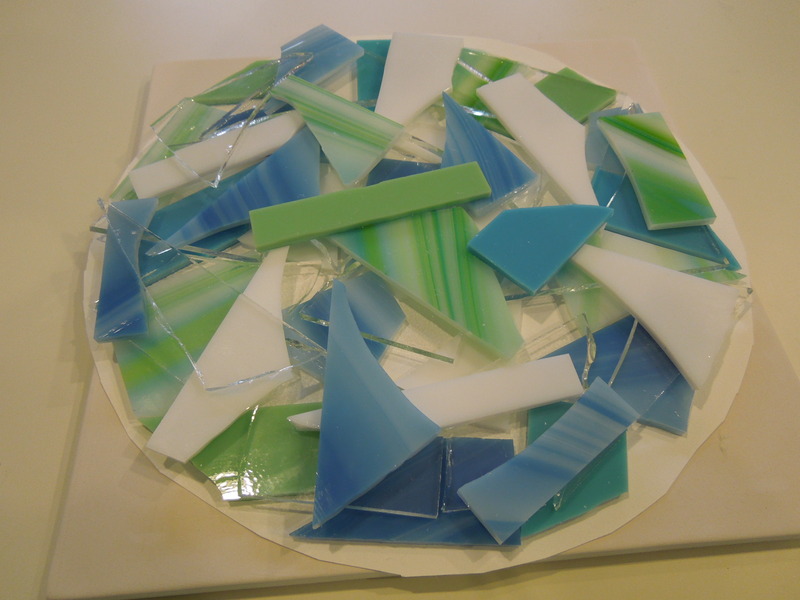 To make the platter, I used a clear base with an opaque white sheet on top (my 2 layers of 3 mm glass). 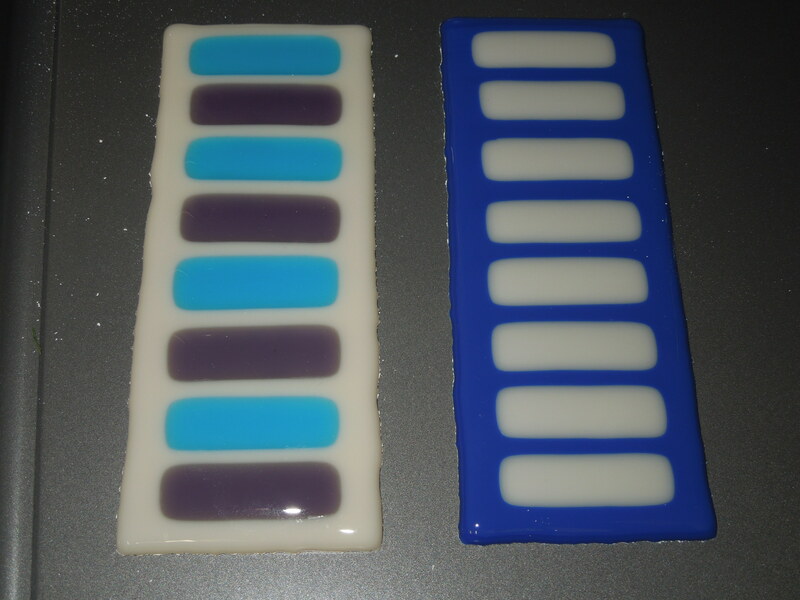 I then centered my original blue/white rectangle in the center (3rd layer). 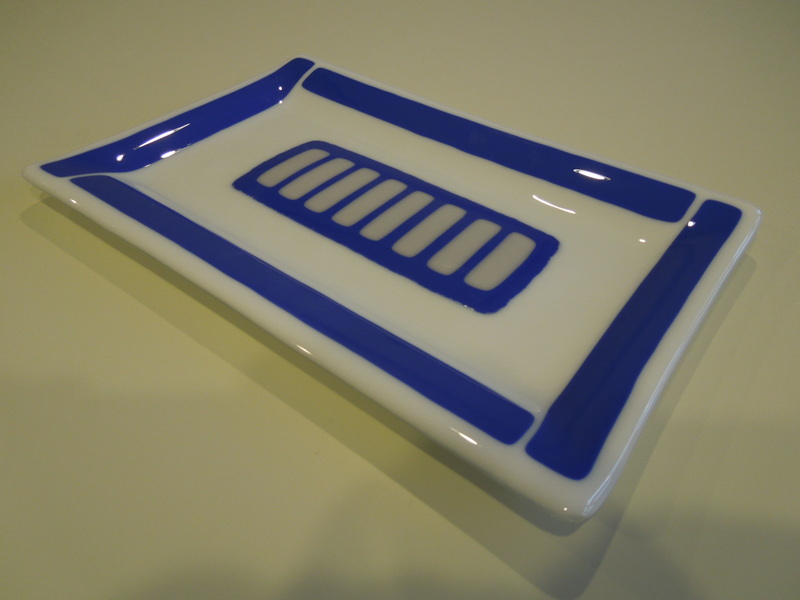 To make a border and add visual interest, I placed 4 strips of cobalt blue near the edges. My pride with the placement of these blue strips is that they did not cause the outer platter edges to bulge out in any way – another early problem I had when layering smaller components. 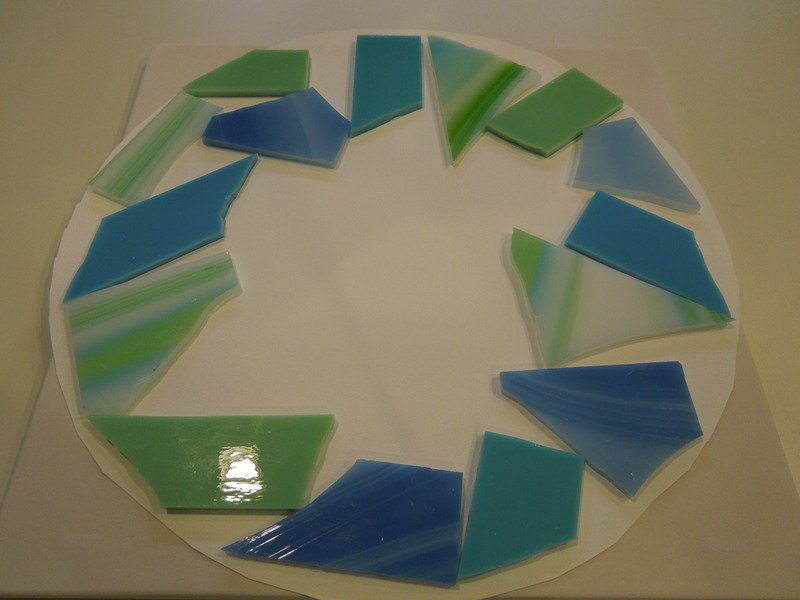 Now, every time I look at this platter, I see it as a symbol of what I have learned in these first months glass fusing. I’m really glad I choose to tackle this demon.